There are billions of sports fanatics and gambling addicts spread out across the world. The majority of them have no clue what fantasy sports are. 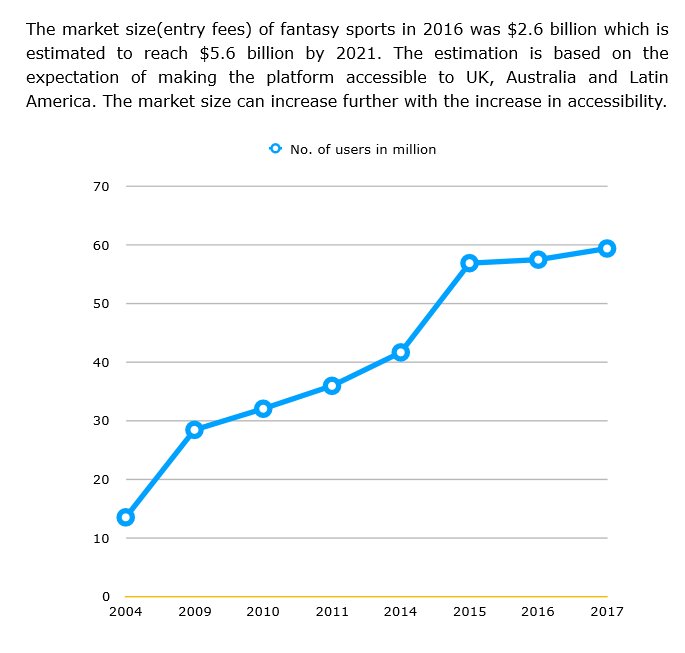 In fact, despite sports like cricket, soccer, and rugby being just as popular over there as NFL and MLB are in the United States, America makes up over 80% of the daily fantasy sports market. Recent stats from https://www.legalsportsreport.com/ show that, over a 1 year period between 2016 and 2017, U.S.-based daily fantasy sports sites took in more than $320 million n revenue, led by industry juggernauts Draftkings and Fanduel, who make up between 80 and 90% of the total market. Strangely, these two giants have so far failed to tap into the international market (perhaps due to legal hurdles). Dfantasy see’s this as their opportunity. Dfantasy is going to tap into the international market by offering cricket and soccer daily fantasy competitions to the rest of the world. They will avoid legal hurdles to entry by democratizing and decentralizing their fantasy sports platform. Dfantasy identifies several issues with conventional platforms that they will fix, such as centralization, monopoly, lengthy verification, and slow withdrawal of funds. They plan to compete by offering much lower fees than their competitors. Also by being decentralized, users do not need an account to access the platform. The unique feature Dfantasy is bringing to the table is a new style of game they will offer called “Odd Fantasy”. In Odd Fantasy, coaches draft their team without a fixed salary cap. They pay real money for the players. So if you wanted, you could make an all-star team with all the best players. You would have to pay for it though, while other coaches may draft a team that doesn’t cost so much. The player with the cheap team has less chance of winning, but better odds. The player with the all-star team has a better chance of winning, but not good odds. Another advantage they offer is speed. When the match ends, the smart contract immediately pays out the winners directly into their wallet. No wait times or annoying fees. The FAN token will be the only token used to participate in the games. Buyins and cash outs are all in FAN token. One special feature the platform offer is the user can host their own fantasy game by staking 10,000 tokens. After the game is finalized the host will get their tokens back as well as a percentage of the rake. The presale has a min cap of 2.3 million tokens and a max of 5.9 million. Distribution: A couple things that stood out: 15% of the funds collected will go to “ICO campaign” and 20% of the tokens allocated will go to the “teams”. They do not provide information about the normal ICO, other than it starts in January. Cofounder Cale Gibson is making me concerned. He fails to even mention Dfantasy in his LinkedIn profile. Praneeth Yashaswi actually has a decent LinkedIn profile. There are 4 advisors to Dfantasy, and they seem pretty knowledgeable in their fields, but I don’t see much blockchain experience. Fanduel and DraftKings have a monopoly on American fantasy sports. The world market is still wide open, though. 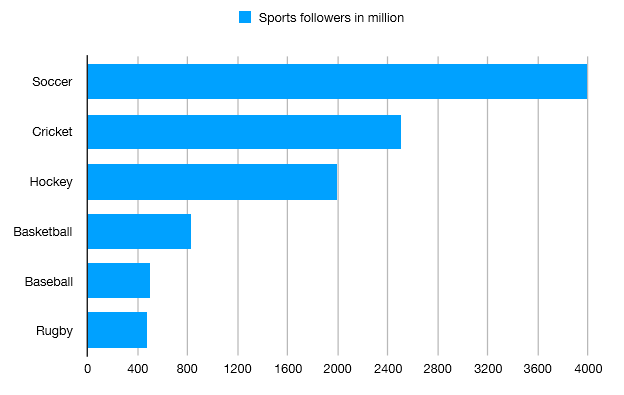 Except in America, cricket and soccer are the biggest sports on earth. Their fans are dying to gamble on daily fantasy sports, and they don’t even know it. Dfantasy has a solid plan to enter the world market by offering cricket and soccer on a decentralized platform. This can only happen if they improve their marketing, though. Their community is extremely weak, almost non-existent. If they can’t sell enough tokens in the ICO they will have no marketing budget. There is also a tremendous amount red flags on this particular project that have me questioning whether these guys are even serious about it, let alone able to execute their gameplan. Competition. There is already a fully operational crypto daily fantasy sports site on the blockchain called No Limit Coin (NLC2). They are lightyears ahead of Dfantasy, and will be hosting cricket and soccer before Dfantasy even puts their beta out. 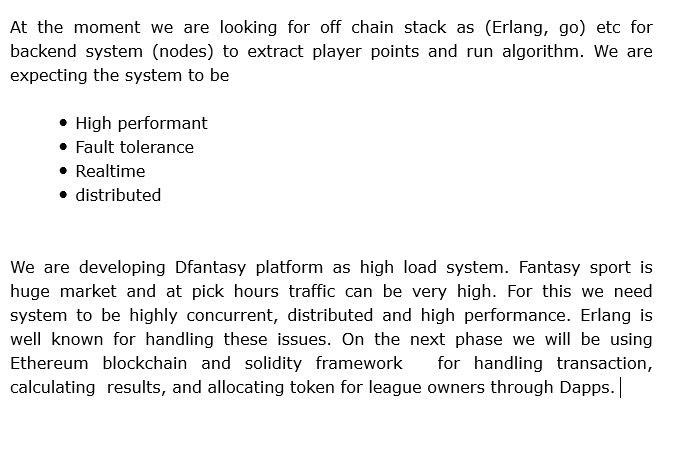 The only advantage the team at Dfantasy has is their decentralized platform. This is copy and pasted directly from the whitepaper. The misspelled words and half-baked ideas represented here alone are a risk.